The Phytophactor: Help for the digitally impaired? Is there any help out there for the digitally impaired and out of date? A commercial on TV had a young relative describe her grandparents' house as hell, no internet, etc. TPP is sort of feeling a bit like that was modeled after his situation. The Phactors have been together for a long time; we’ve already been through a primary, secondary, and in some cases tertiary and quaternary episodes of appliance meltdowns and replacements. They’ve tended to come in waves where several old, reliable appliances all give up the ghost at the same budget-busting time. On the whole things have lasted well for us. Our luck with dishwashers and microwave ovens being the worst. One old hot water heater became a collector’s display piece at a local business because of its age and uniqueness after they stopped laughing about "can it be fixed?" At our stage of life it becomes hard to remember how old some items are. In the last few days the CD players on two stereos both ceased to function, and "Martha Stewart" demands Christmas music while decorating and making cookies and the like. Young ones, should any read this blog (doubtful), may not really remember CDs or their advantages over 8-track tapes, 33 1/3 LPs (mostly stereo, but the oldest are mono), 45s (TPP never actually collected them), and 78s. One stereo was easily fixed by bringing an ancient, but seldom used CD player home from TPP’s office, which is fine for the compact system in the kitchen. But the main stereo had a 5 disk changer, and a still powerful 150w per channel tuner/amp to push some pretty fine speakers to their limits. TPP used Tusk (1979)(there's also a version using the USC Trojan marching band) by Fleetwood Mac to signal the F1 that it was time to rise and shine (usually in the vicinity of noon). So as the Phactors contemplate a new TV, it just doesn’t seem right to embrace too much change all at once. But whether to update or not will be debated, but TPP just doesn’t want to give up his stereo equipment just yet; it'd be like giving up a Corvette for a Prius. While that's OK for cars; this is sounds! 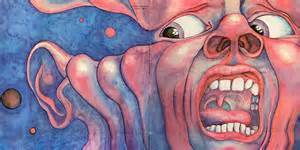 Might have to go find that King Crimson album (front and back cover illustration above) and test the turntable.